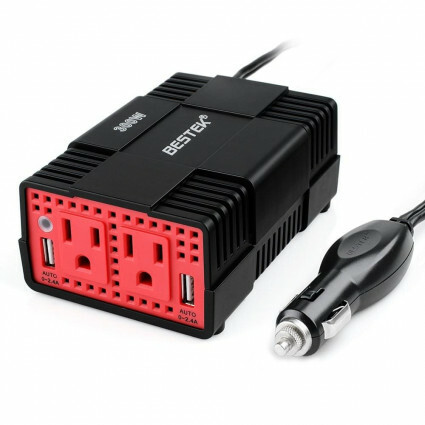 BESTEK 300W power inverter has dual AC outlets plus two USB ports and can stay powered up while on the road. Keep your laptop, phone, tablet or other devices charged and running all the day. Included cigarette lighter plug is workable for any vehicle, more convenient for car users. 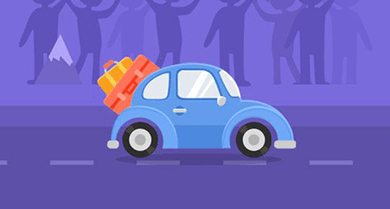 The power inverter can provide 300 watts continuous DC to AC power and 700 watts of peak power, converting your car battery into continuous high power for multiple charging purposes on the road, or remote area without electricity. Power converter with 2 AC outlets and 2 USB charging ports can power your four electronic devices simultaneously. 2 USB charging ports with Smart IC technology automatically detect your devices to deliver its fastest charge speed up to 2.4 amps per port/4.8 amps max. Small sized and lightweight, the voltage converter is convenient to use on the road, at campsites, at remote job sites or anywhere that power is needed. The 26 inch cigarette lighter plug is easy for you to plug directly into a cigarette lighter socket. Built-in 40 amps Fuse & Cooling Fan with Full-Protection, including low battery alarm, low battery shutdown, overload protection, short circuit protection. (Applied for a 12V car but not 24V).